"Jesus to Nicodemus," The Jesus Database, an online annotated inventory of the traditions concerning the life and teachings of Jesus. Dr. Gregory C. Jenks, FaithFutures Foundation. XXXII.40-47; Tatian's Diatessaron (c. 150-160). From Augustine's Tractates on John: Tractate XII (3:6-21). "The Spirit is present that we may be born; the Spirit is invisibly present whereof thou art born, for thou too must be invisibly born." "Christ does not condemn, but rather despising Christ condemns." "So long as he continues under a load of unforgiven guilt, there can be little else than slavish fear of God; but when his doubts are done away, when he sees the righteous ground whereon this forgiveness is built, he rests on it as his own, and is united to God by unfeigned love." "He must be lifted up, that hereby he may purchase salvation for all believers: all those who look to him by faith recover spiritual health, even as all that looked at that serpent recovered bodily health." "The Mysteries of the Brazen Serpent," John 3:14, Charles H. Spurgeon, 1857. "None but Jesus," John 3:18, Charles H. Spurgeon, 1861. "None but Jesus--Second Part," John 3;18, Charles H. Spurgeon, 1861. "Though "condemnation" is to many the issue of Christ's mission (Joh 3:19), it is not the object of His mission, which is purely a saving one." "Immeasurable Love," John 3:16, Charles H. Spurgeon, 1885. "Usually it is not evidence, but an honest heart and a sincere desire for truth, that are needed in order to faith." Commentary, John 3:14-21, Lance Pape, Preaching This Week, WorkingPreacher.org, 2015. "Placing our trust in this Jesus means confronting the inconvenient truth that God's purposes for those God loves are not synonymous with our own common-sense values of happiness, health, and safety." "But the message that is to be both proclaimed and lived is one of Life and Light and Truth." "God's Offensive Love," David Lose, ...in the Meantime, 2015. "The kind of self-sacrificing love Jesus offers is frightening to such a world. No wonder some run and hide, as it requires us to trust nothing other than God." "Facing Evil, Coming to Light," D. Mark Davis, Left Behind and Loving It, 2015. "...just as 'the Word' referred to something real, creative, and inseparable from God before the Word 'become flesh and dwelt among us,' so too 'the light' is a description of Jesus as larger than life, larger than the historical presence of Jesus who was sent." "John 3:16 -- What Else Is There To Say?" Karoline Lewis, Working Preacher, 2015. "So, we start with anticipating and acknowledging our feelings about what it means to preach on this verse...And then? Perhaps another word of encouragement from Craddock will help, 'Preach like you know they almost didn't come.'" "Eternal Life and Selma," Nancy Rockwell, The Bite in the Apple, 2015. "Emphasis on the afterlife changes the attention paid to this life, making changes relatively unimportant, and obedience very important." "Speaking to the Soul: A Game of Inches," David Sellery, Episcopal Cafe, 2015. "Except for the rare dramatic conversion, growing in God's love is usually a game of inches… carrying the cross, sticking to fundamentals, avoiding errors." "Living in the Light," Sharron R. Blezard, Stewardship of Light, 2015. "Live by Light," Nikki Hardeman, FaithElement, 2015. "Light, Faith and Eternal Life," Bob Cornwall, Ponderings on a Faith Journey, 2015. "The Politics of Reckoning," D Mark Davis, Political Theology Today, 2015. "Lift High the Cross!" Peter Lockhart, A Different Heresy, 2015. "Light and Darkness," Janet H. Hunt, Dancing with the Word, 2015. "What does it mean for you to 'stand in the light?' How has that brought life to you?" "Practicing," Alan Brehm, The Waking Dreamer, 2015. "Our faith, our truth, our convictions are meant to be put into practice in our lives. But that's not something you learn to do like riding a bike: once you learn it you've got it. It's more like learning a musical instrument: we're always learning how to practice faith in real life." Evangelio Comentario Del San Juan 3:14-21, J. Manny Santiago, Working Preacher, 2015. "Nicodemus," sermon discussion from Frederick Buechner, Frederick Buechner Blog. "Nicodemus had heard enough about what Jesus was up to in Jerusalem to make him think he ought to pay him a visit and find out more. On the other hand, as a VIP with a big theological reputation to uphold, he decided it might be just as well to pay it at night. Better to be at least fairly safe than to be sorry, he thought, so he waited till he thought his neighbors were all asleep." Commentary, John 3:14-21, Marilyn Salmon, Preaching This Week, WorkingPreacher.org, 2012. "As a small minority, the Johannine community did not have the power or influence to marginalize others or cause harm by excluding them. In the western world, Christianity has been the dominant religion for centuries, whether supported by the state or not, and it has the power to marginalize and exclude those who do not conform." "Love or Justice?" David Lose, Dear Working Preacher, 2012. "...I invite you to give some thought to this passage from John, to your beliefs about God's primary character, and to considering what your people most need to hear." "Lifted High," Rick Morley, 2012. "...the event of the cross isn’t just an advertisement, or a show. It actually does something. The cross is effectual." "Wearing My Sin on the Front of My Alb," Janet H. Hunt, Dancing with the Word, 2012. "John 3:16 is perhaps the most familiar of passages. Does that make it easier to 'preach' or more difficult? What has been your experience?" "John 3:16 - The Rest of the Story," Carl Gregg, Patheos, 2012. "Some Christians have called John 3:16 'the Gospel in a nutshell,' but John 3:16 is not enough to form a fully mature Christian life." "The Axe of Forgiveness - The Love of God," Neil Chappell, a weird thing, 2012. "The Politics of John 3:14-21," Timothy F. Simpson, Political Theology, 2012. Holy Textures, Understanding the Bible in its own time and in ours, John 3:14-21, David Ewart, 2012. "No one is saved by intellectual agreement with a belief. Salvation is all about the restoration of broken relationships. Being saved means being restored to the proper bond and trust of true kinship with God." "Fear on a Stick," Peter Woods, I Am Listening, 2012. "In Jesus, Nicodemus found what he was seeking. One who could help him face the sum of all his fears, change and death." "Nic at Night," Russell Rathbun, The Hardest Question, 2012. "Does the Gospel include God's past deeds being exposed to the light as well our own?" "Walking in the Light," Alyce M. McKenzie, Edgy Exegesis, Patheos, 2012. "John the Evangelist was a master of chiaroscuro long before Rembrandt." Commentary, John 3:14-21, Sarah Henrich, Preaching This Week, WorkingPreacher.org, 2009. "First Thoughts on Year B Gospel Passages in the Lectionary," Lent 4, William Loader, Murdoch University, Uniting Church in Australia. "Whatever our own solution to the issues of inclusion and exclusion, John?s gospel asks us to recognise that to reject the love and light and truth we see in Jesus is to choose death ? wherever and whenever we do it, and to receive it means life, life our world which God still loves desperately needs." "John 3:14-21," Gospel Analysis, Sermons from Seattle, Pastor Edward F. Markquart, Grace Lutheran Church, Seattle, Washington. Detailed background and exegesis. "If the solution in Numbers was a snake raised up on a pole -- because the problem was poisonous serpents on the ground; so in John if the solution is a human (the Word made flesh) on a pole, the problem must be the humans on the ground." Join the Feast, John 3:14-21, Jenny McDevitt, Union PSCE, 2009. "We are given the choice between light and darkness, between belief and unbelief ? but that choice of whether to love God, or not, is ours only because first, 'God so loved the world.'" "Darkness and Light," Lent 4B, Larry Broding's Word-Sunday.Com: A Catholic Resource for This Sunday's Gospel. Adult Study, Children's Story, Family Activity, Support Materials. "Have you ever been in the 'dark' about something? What happened when a 'light' was thrown on the subject?" Wellspring of the Gospel, Lent 4B, Catherine McElhinney and Kathryn Turner, Weekly Wellsprings. "In the Light," Preacher's Magazine, 2009: Listening to the Text, Engaging the Text, Preaching the Text. "Serpents, Penguins, and Crosses," Preacher's Magazine, 2006: Listening to the Text, Engaging the Text, Preaching the Text. "God's Love in Christ," Rev. Bryan Findlayson, Lectionary Bible Studies and Sermons, Pumpkin Cottage Ministry Resources. Includes detailed textual notes. "Some 'brands' of faith give the impression God is, on (im)balance a condemnatory figure looking for excuse to be destructive. But as17+ helps us understand, the God revealed in Jesus is not like that at all." "Is Trust in Jesus Worth the Cost?" Trinity A, Larry Broding's Word-Sunday.Com: A Catholic Resource for This Sunday's Gospel. Adult Study, Children's Story, Family Activity, Support Materials. "Have you ever found belief in something easier than trust in someone?" "The Manifestation of the Messiah (John 1-4)," by Robert Deffinbaugh at the Biblical Studies Foundation. "Our Lord came as light to reveal man?s need of a Savior." "In John, being "lifted up" refers to one continuous action of ascent, beginning with the cross but ending at the right hand of the Father." "Jesus and Nicodemus (John 3:1-21)," by Robert Deffinbaugh at the Biblical Studies Foundation. "I must ask you, my friend, 'Are you a Christian, or are you just religious?' "
John 3:14-21, in Austin Presbyterian Theological Seminary's An Exegetical Study of the Common Lectionary, coordinated by Prof. John E. Alsup, features rough translation, disposition, immediate context, broader context, hermeneutical bridge, and contemporary address. "Since we have so many symbolical terms in the pericope at hand, these Greek speaking Jewish Christians, scattered throughout Asia Minor, could most likely appreciate the figurative images as well as enjoy discussing their meanings. For example, the concept of doing what is true, is a notion that requires dialogue to begin to comprehend. Somewhere its noted that Hellenists had developed a confidence in philosophy as the way to truth. Is that sentiment what they could recall when reading in this passage of doing what is true?" Barron, Duane, "For God So Loved the Cosmos: The Good News, Ecology and Christian Ethics," Restoration Quarterly, 2005. Bartlett, David L., "Inclusive or Exclusive Grace?" The Christian Century, 1991. Bassler, Jouette, "Mixed Signals: Nicodemus in the Fourth Gospel," Journal of Biblical Literature, 1989. Born, J. Bryan, "Literary Features in the Gospel of John (An Analysis of 3:1-21)," Direction, 1988. Dart, John, "Scriptural Schemes: the ABCBAs of Biblical Writing," The Christian Century, 2004. Gundry, Robert H. and Russell W. Howell, "The Sense and Syntax of John 3:14-17 with Special Reference to the Use of 'OYTOS...OSTE' in John 3:16," Novum Testamentum, 1999. Lowry, James S., "By the Waters of Babylon," Journal for Preachers, 1992. Marshall, Ronald F., "Our Serpent of Salvation: The Offense of Jesus in John's Gospel," Word and World, 2001. Miller, Donald G., "John 3:1-21: Expository Article," Interpretation, 1981. Nicole, Roger R., "John Calvin's View of the Extent of the Atonement," Westminster Theological Journal, 1985. O'Day, Gail, "Piety Without Pretense, Faith Without Falsehood: The Lenten Journey According to John," Journal for Preachers, 1997. Roberts, R.L., "The Rendering 'Only Begotten' in John 3:16," Restoration Quarterly, 1973. Towne, Edgar A., "Reason and the 'More Excellent' Spirit: A Reformed Reflection on John 3:16," Encounter, 2005. Wead, David W., "The Johannine Double Meaning," Restoration Quarterly, 1970. "Like It Or Not," the Rev. Dr. David Lose, Luther Seminary, 2012. "The World God Loves," the Rev. John H. Thomas, United Church of Christ, 2009. "I Want to Walk As a Child of the Light," 26 March 2006, David Zersen, Göttinger Predigten im Internet: Every Sunday Sermons based on the RCL by a team of Lutheran theologians/ pastors. "In the Light," Rev. Bethany Hull Somers, Preacher's Magazine, 2006. "Serpents, Penguins, and Crosses," Jim Fitzgerald, Preacher's Magazine, 2006. "For God So Loved the World," "In Him," Sermons from Seattle, Pastor Edward F. Markquart, Grace Lutheran Church, Seattle, Washington. "Journey toward Faith: A Lenten Sermon on John 3:16," Tim Johnson, The Center for Progressive Christianity. "What is Truth?" Paul Tillich. From The New Being (1955), at Religion OnLine. "The Address of God's Love," Frances Woodruff, On the Chancel Steps, 2012. "John 3:14-21," Faith Formation Journeys, 2012. "Jesus and Nicodemus," children's study, puzzles, coloring sheet, etc. Higher Praise Christian Center. Crossword on John 3 & 4, Don Crownover's Bible Puzzles. "What's on the Inside Counts," Sharon Brumfield, sermons4kids.com. John 3:16, memory verse activity, MSSS Crafts and Resources for Bible Stories. Clip Art Images: John 3:14-21, Misioneros Del Sagrado Corazón en el Perú. John 3:14-21, at Cerezo Barredo's weekly gospel illustration. Liberation emphasis. John 3:16, Heartlight - Free Christian PowerPoint Backgrounds. 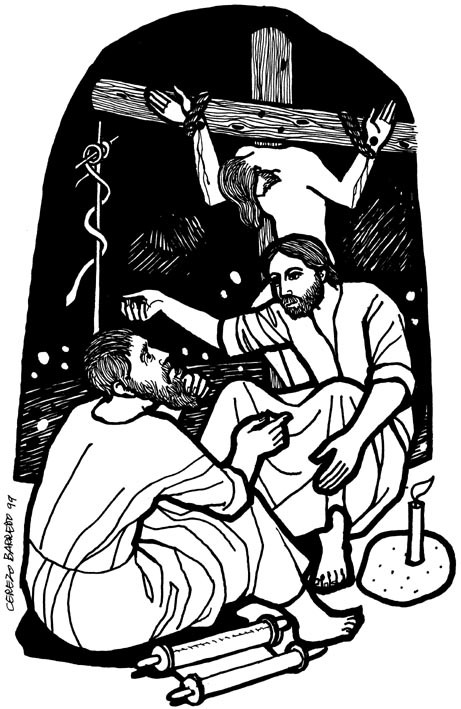 Clip Art: Jesus Teaches Nicodemus, Julius Schnoor von Carolsfeld woodcuts, World Mission Collection, Wisconsin Evangelical Lutheran Synod. PowerPoint Slides for Lent 4B (John 3:16), Bulletin Cover (John 3:16-17), Will Humes, Word & Table. Commercial Site: "John 3:16," Film/Visual Liturgy, The Work of the People. "Tell Me, Dear Tree," Hymn based on John 3:14-18, Matthew 16:24-26, Mark 8:34-37, and Luke 9:23-25, Lisa Ann Moss Degrenia, 2012. Hymns with Scripture Allusions: John 3:14, 16. The Cyber Hymnal. "A Prayer for Mission," "Take up Your Cross," Brenton Prigge, NewHymn, a new, relevant hymn set to traditional tunes.